Are you searching for a color scheme for part of your home but don’t know where to start? Use your own experience and preferences to take the guesswork out of it. Think about a place you’ve loved or thought was beautiful. Maybe you’ve visited the location or you hope to visit in the future. Take a photo or search for one that embodies all the things about it that you enjoy. Got it? Now use those colors to make your space reflect the destination that brings you happiness. Each time you enter the room, you will always think about its inspirational theme. While it may be easy for us to tell you to just pull the colors out of the photo you’ve chosen, we’ve got an example here for you that will help you understand what we’re talking about. We want you to look deep into the photo and pull out all the colors you see, even the ones that are not as dominant as others. For our sample, we have a photo of small waves crashing onto the beach. To the right of the photo are some of the colors that come from this simple scene. The more complex the scene, the more colors you will be able to pull from it to create your palette. The top two shades are your neutrals and would be great for your wall colors or floor. 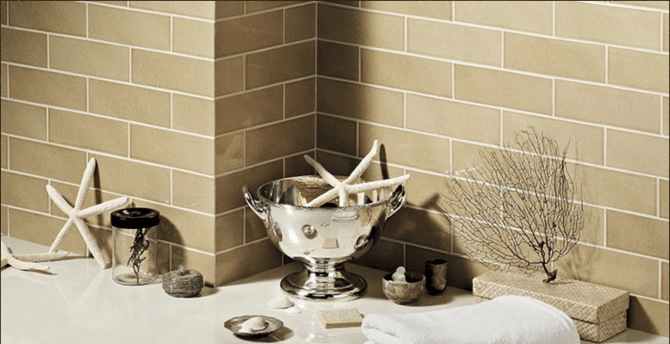 The second photograph shows a great way to use tile to fulfill this color theme and can be found here. These colors will be easy to build on since there are a lot of furniture choices that would pair well with them. The four hues below that are various blues and greens, which are perfect for evoking a sense of calm to the space. This may be the exact reason you love to visit the ocean in the first place. Now you can have that feeling in your own home! Use these colors for an accent wall or sprinkle accessories with the same hues throughout the room. Paint a few frames in these colors to keep the theme going on the neutral walls. 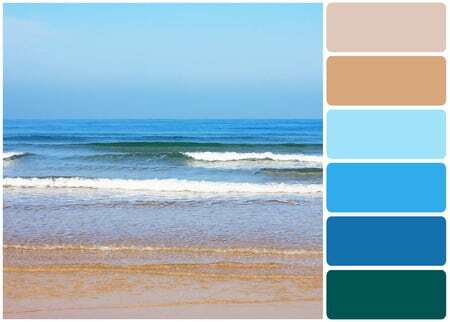 White painted furniture would also go well with these colors since you can also pull that color from the sea foam in the picture. The deeper you look, the more colors you can find. So, get started and have fun building a color palette you’ll love!